providing a sound career platform for individual members with the associated benefits to their authorities. Since that time, some 650 colleagues have obtained the award of the Certificate. 53 of those have gone on to obtain the award of the Diploma. 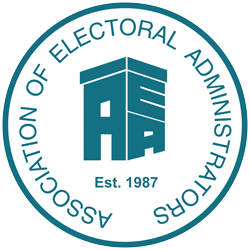 A supplementary objective was to aid the professional development and recognition of the AEA by persuading local authorities of the worth and value of their electoral staff being recognised by the fact that they had achieved the only professional qualification in electoral administration in the UK. That objective has clearly been achieved as evidenced by the vast majority of job adverts for electoral administrators requiring potential candidates to hold or being studying for the AEA Qualification. The Association continues to be committed to raising the profile and enhancing the status of electoral administrators who perform such a vital role in the democratic process. It is also dedicated to encouraging and maintaining the highest possible standards of work provided by its members. The Qualification is offered on a progressive route from a Foundation course to a Certificate and then to a Diploma. A diary of dates for 2018 can be seen below. preparing members for undertaking the Certificate level of the Association’s Qualification. The Course is delivered in five modules on an annual basis, (two dealing with electoral registration and three on the administration of elections). All of the modules closely follow the Certificate syllabus. Persons completing the five modules receive a Certificate of Attendance and a copy of the following year’s Foundation Course manual. It is a requirement that members wishing to undertake the Certificate have attended or will complete the Foundation Course by the end of the calendar year in which they wish to register or, alternatively, can demonstrate three years’ relevant work experience before being able to register for the Certificate programme. Candidates must be members of AEA at the time of registration and at all times throughout the Qualification process. This page contains links to the documentation you will need to register. The Certificate syllabus consists of two modules (C1 – Electoral Registration and C2 – Elections Administration). The aim of C1 is to provide an understanding and appreciation of the processes involved in electoral registration. Candidates are required to demonstrate clear understanding of the legal and administrative frameworks governing the registration of electors and an ability to translate that knowledge into the workplace in terms of undertaking the necessary administrative processes for the proper conduct of electoral registration. The aim of C2 is to provide an understanding and appreciation of the processes involved in the administration of all types of elections. Candidates are required to demonstrate clear understanding of the legal and administrative frameworks governing the conduct of elections and an ability to translate that knowledge into the workplace in terms of undertaking the necessary administrative processes for elections leading up to, including and beyond the election itself. This part of the Qualification must be completed within two years of the appropriate annual registration date except that this requirement may be extended to allow a resit at the first assessment day following the second anniversary of the above annual registration date. Registration must be made by 1st September in each year. An induction course for the programme is held within two/three weeks of the registration deadline. A programme of four work-based assignments will be issued to candidates following the annual registration date. The assignments must be submitted in strict numerical order by 31st December, 31st March, 30th June and 30th September respectively in the year after first registration. All four must be passed. Any assignments which are deemed to be failures may be resubmitted once and must be resubmitted within two months of the notification of failure. a written examination of 2 hours consisting of five questions from module C1 of which three must be answered. a written examination of 2 hours consisting of five questions from module C2 of which three must be answered. If either part of the assessment is failed, the candidate may resit the appropriate part(s) once at the next following assessment day (i.e. for July fails at the January session or for January fails at the July session). An examination techniques course is held about two months prior to each assessment day. Once a candidate has achieved four passes for assignments and passes for both parts of the assessment day, the Certificate in Electoral Administration will be awarded. The successful candidate will be entitled to use the designatory letters AEA (Cert) (or AEA (Cert-Scotland) in Scotland) provided that the candidate remains in membership of the Association. A candidate may not apply to register for the Diploma unless they hold the Certificate. The Diploma syllabus consists of three modules (D1 – Electoral Law; D2 – Public Administration, Electoral Arrangements and Electoral Systems; and D3 – Management and Finance). The aim of D1 is to provide an understanding and working knowledge of the law relating to the registration of electors, the conduct of elections and the establishment and review of electoral boundaries. Candidates are expected to demonstrate a thorough knowledge of the main principles of British electoral law and an ability to use that knowledge to provide sound working practices at a senior level and to offer advice to all those having an interest in such matters. other electoral systems in common use in other democracies. Candidates are expected to demonstrate a sound background knowledge of British local government and constitutional matters, a clear working understanding of matters relating to boundaries and other quasi electoral arrangements and be able to comment authoritatively on a variety of other electoral systems specified in the syllabus. specific financial and related considerations in the registration of electors and the conduct of elections. Candidates are expected to demonstrate an ability to translate knowledge into practice in all fields of management covered in the syllabus and to be able to demonstrate a sound knowledge of financial matters relating to the work of a senior electoral administrator. All candidates at Diploma level will be assumed to have a detailed working knowledge of all matters contained within the two Certificate modules. This part of the Qualification must be completed within two years of the appropriate annual registration date except that this requirement may be extended to allow a resit at the first assessment day following the second anniversary of the above annual registration date. Registration must be made by 1st October in each year. A dissertation on one subject selected from a list of four published by the Examining Board or, alternatively, a different subject approved by the Board upon personal application must be submitted by 30th September following the registration date. An outline of the dissertation must be submitted by the previous 31st January in accordance with the procedures issued by the Qualifications Board. A dissertation outline which does not meet the required standard may be resubmitted once and must be resubmitted within one month of the original notification. The dissertation must be between 7,000 and 10,000 words and submitted in accordance with the procedures issued by the Qualifications Board. A dissertation which does not meet the required standard may be resubmitted once and must be resubmitted within two months of the original notification. An oral examination linked to the dissertation will take place by 31st January or, in the event of a re-submission, by 1st March. If the oral examination is failed, the candidate may re-sit the examination once. The second examination will take place within three months of the original notification. A dissertation workshop is held within two/three weeks of the registration deadline. a written examination of 2.5 hours consisting of six questions (three each from modules D1 and D2) of which four must be answered (two from each module). a written examination of 2 hours consisting of five questions from module D3) of which three must be answered. If either part of the assessment is failed, the candidate may resit the appropriate part(s) once at the following assessment day to be held in September of the following year. An examination techniques course is held about two months prior to the assessment day. Once a candidate has reached the required standard for his/her dissertation, passed the oral examination and achieved passes for both parts of the assessment day, the Diploma in Electoral Administration will be awarded. The successful candidate will be entitled to use the designatory letters AEA (Dip) provided that the candidate remains in membership of the Association. Go to this page where there are links to enable you to download the necessary documentation.